If you use any type of navigation app, then you know that it will usually talk over anything else you’re listening to. For music, this may be fine, but if you’re listening to an audiobook or a podcast, then it can be pretty annoying. Apple Maps will “duck” your music when giving navigation prompts. This means it will lower the music volume slightly when it’s talking so you can hear the navigation. Of course, when it does this during an audiobook or podcast, you’ll miss what was just said because Apple Maps was talking over it. 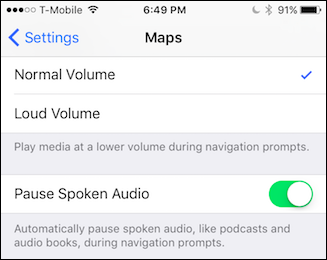 If you’re using Google Maps, there’s little you can do about this, but Apple Maps has a feature that you can turn on that will automatically pause spoken word titles like books and podcasts during navigation prompts. 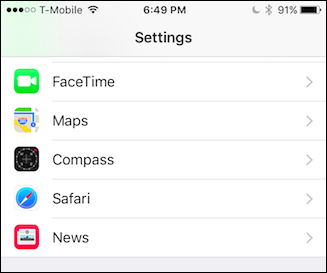 To turn on this option, first open the settings on your iPhone or iPad, then tap on “Maps”. Once you’re in the Maps settings, scroll down to “Pause Spoken Audio” and enable it. Once enabled, spoken audio such as podcasts and audio book will pause during navigation prompts. No doubt, anyone who travels a great deal and listens to books, podcasts, or other spoken words titles will find this option very convenient. It may even be a good reason to use Apple Maps instead of Google on those long drives. Matt Klein has nearly two decades of technical writing experience. He's covered Windows, Android, macOS, Microsoft Office, and everything in between. He's even written a book, The How-To Geek Guide to Windows 8.